Atheist Geek News » Uncategorized » The Mayans Were Wrong! Why The Hell Am I Still Here??? « The End Is Nigh! Again. Thanks, Mayans! The Mayans Were Wrong! Why The Hell Am I Still Here??? 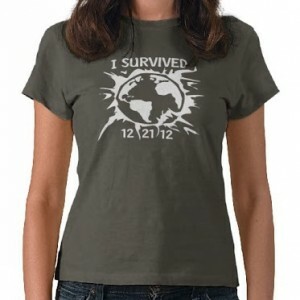 Actually, the geniuses who seem overeager for the world to end were wrong. The Mayans never predicted that the world would end yesterday. Like so many other things, some jerk made that up. And a bunch of you fell for it. Not that it’ll make any difference. Cash money says someone will come up with an explanation for this failure of nonexistent prophecy by inventing some new date based on the Mayan calendar and claiming that was the real date all along. Millions eager to see the world end will believe them. I wonder how many went nuts last night and sold all their stuff or drank themselves into needing a new liver? Don’t be that kind of smart, kids. Please. You should have been getting laid. Amateurs. Learn from your mistakes! 2 Responses to The Mayans Were Wrong! Why The Hell Am I Still Here??? Unlike Jesus, who did schedule the end of the world for the 1st century. They have already figured it out! It had to do with the cumulative effect of thousands of years of leap days! The new date is March 15, 2015. There’s enough time to write and publish new revised editions of all of those end-of-the-world books. On March 16, 2015, they’ll figure out that they left something else out. Rinse and repeat, for as many times as the suckers will buy the books and seminars. We need to obey the faithful and discreet slave to have Jehovah’s approval.